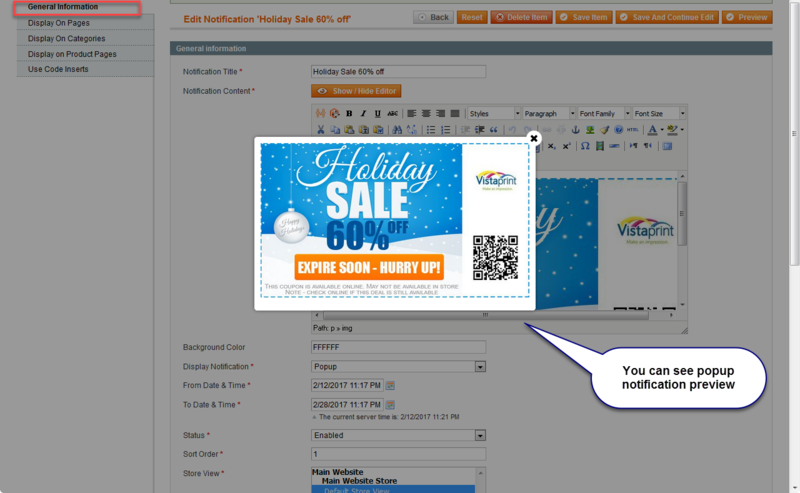 Display notification in lightbox popup. You can see preview before save the notification section using preview option. Display notification in top and bottom bar. 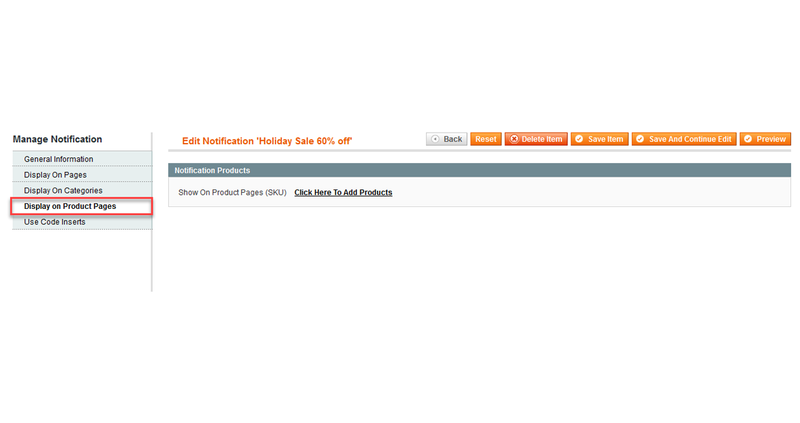 Display notification in categories, shopping cart , product and CMS pages. Set notification with start date time and end date time. 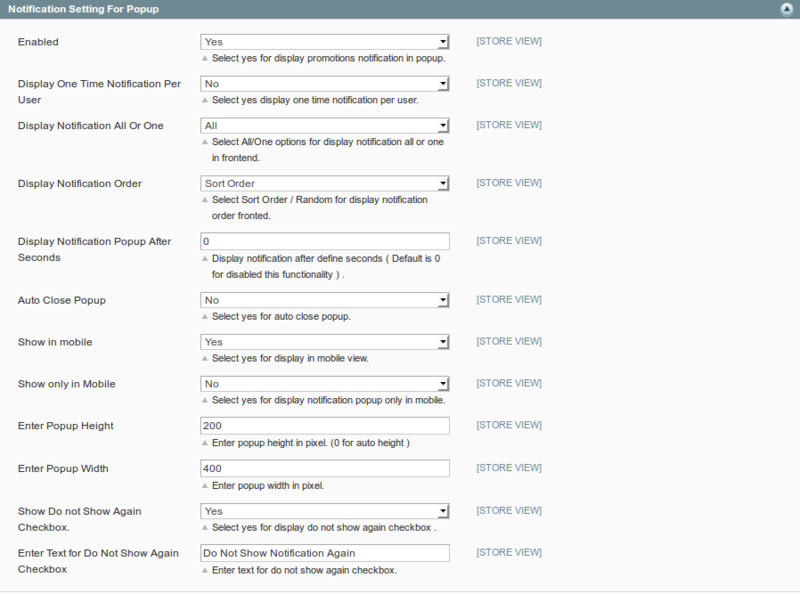 Set notification base on customer group. Manage notification with session management. Set seconds for display notification after page load. Set seconds to auto close notification. 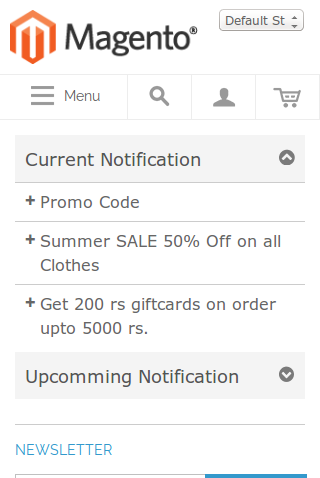 Promotions Notification Pro extension helps notify and keep your visitors, customers informed about latest news, announcements, promotions, subscription, new offers, discount, deals or to educate about new updates and much more. You can set your notification in Bar/Bottom and Popup with many configuration options. Enter your notification title , notification content with editor , notification background color . 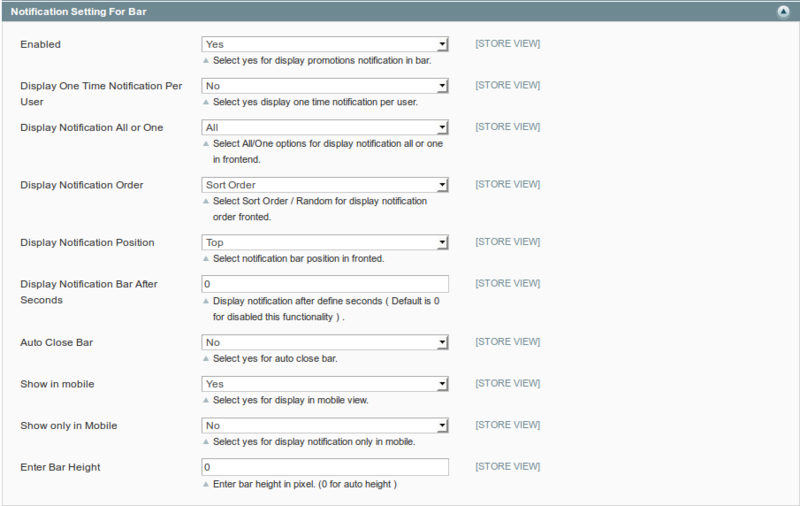 Select CMS pages that you want to display notification. Select Yes for display notification in shopping cart page. Select categories that you want to display notification. Select product that you want to display notification. 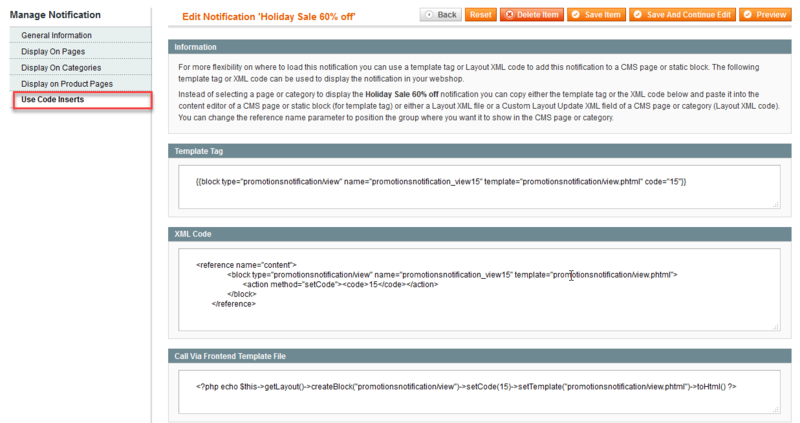 Copy related file code and put in xml , phtml and php file for display notification in your custom pages. Needed a simple extension to offer discounts on certain products. 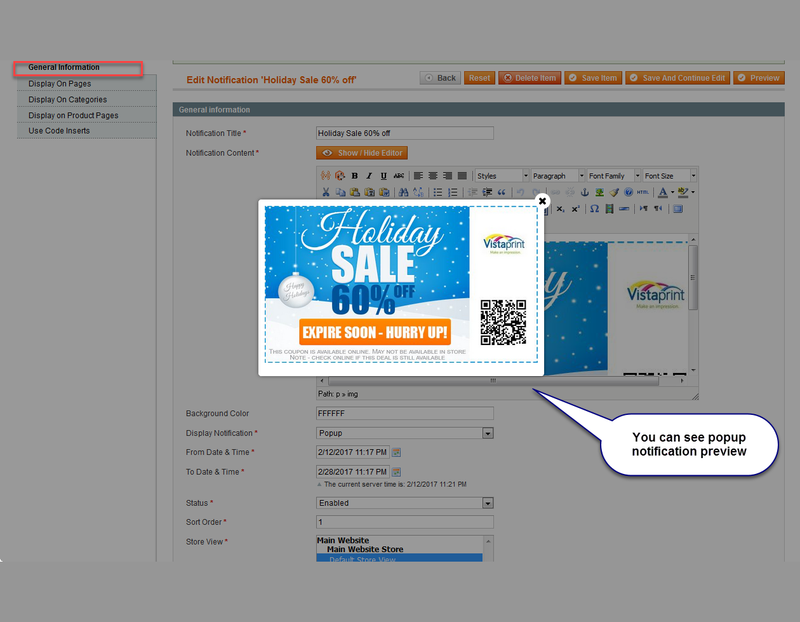 Most other extensions on the market offered a blanket pop up but with Promotions Notification Pro you can choose exactly where you would like pop ups to show. The only limitation is that they all have to be the same size which we can work around. Brilliant extension with first class support when a bug was found. Perfect Extesion! Excellent developer support! Initially we had problems, saving new notifications. It didn't accept our from and to date fields. But after mailing support, this problem was fixed within a few hours. It was related to date format settings. Now it works like a charm! Thanks again! Extension has with all the required features, easy to use and excellent developer support, who quickly helped me with all my questions and customization of it. Augmentation has no Issues. The support is truly magnificent. Extremely cooperative in altering issues assuming any. Undoubted support. Proceed with no delay. 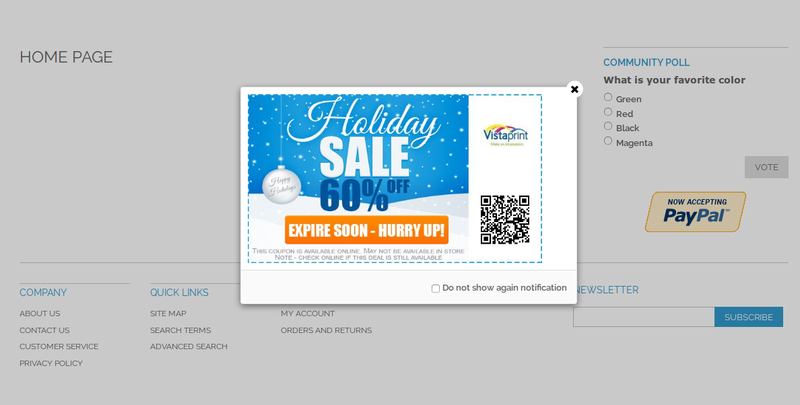 Searching for Promotions Notifications extension and lucky stuck with this extension. Superb extension with all the required features. Thank you. Excellent extension. Excellent developer support! This extension does exactly what it says and support is excellent. The service is fast, reliable and very friendly. 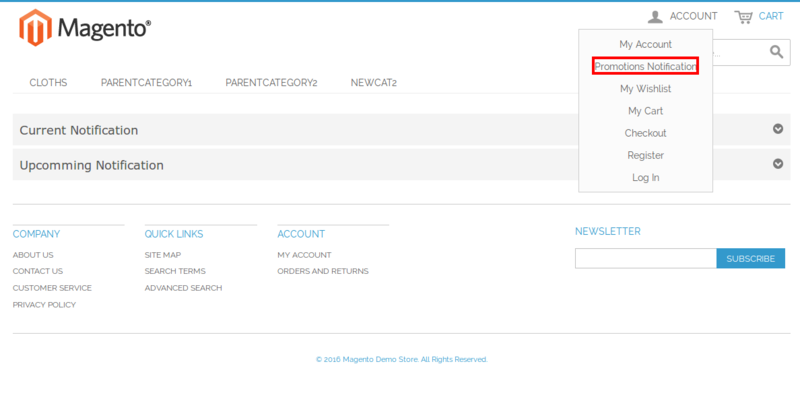 Manage Show / Hide notification in checkout page from admin. 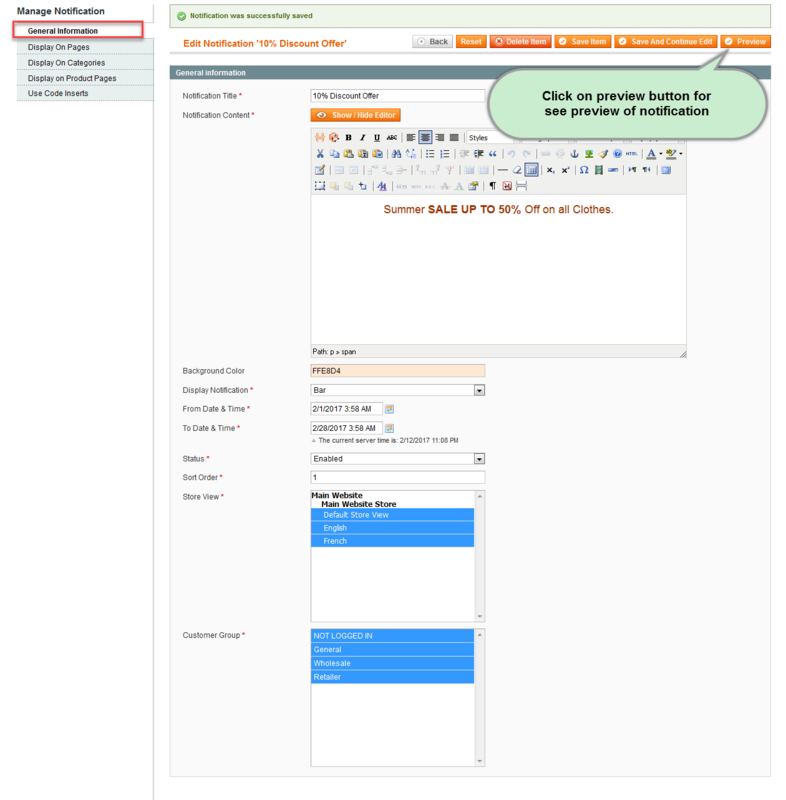 Manage Show / Hide and change text of "Do not Show again Notification" checkbox from admin. Manage Show / Hide notification only in Mobile device. You can see preview of notification in admin. 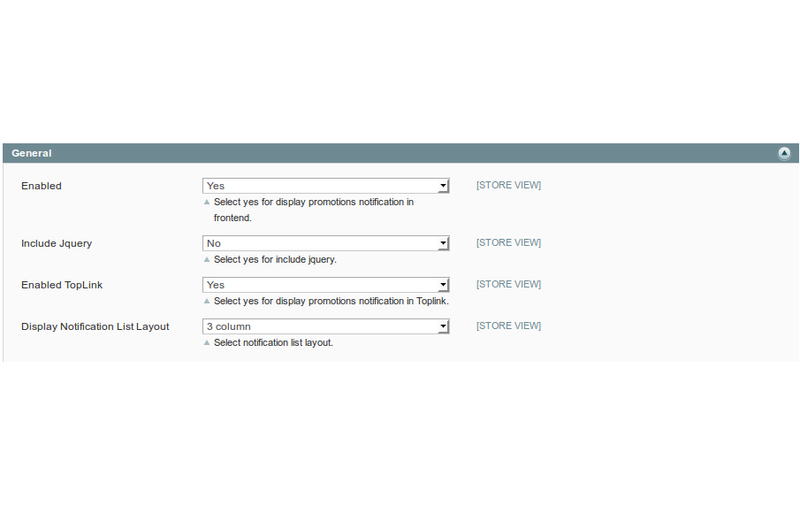 Q-1: I configure Promotions Notification Pro Extension. 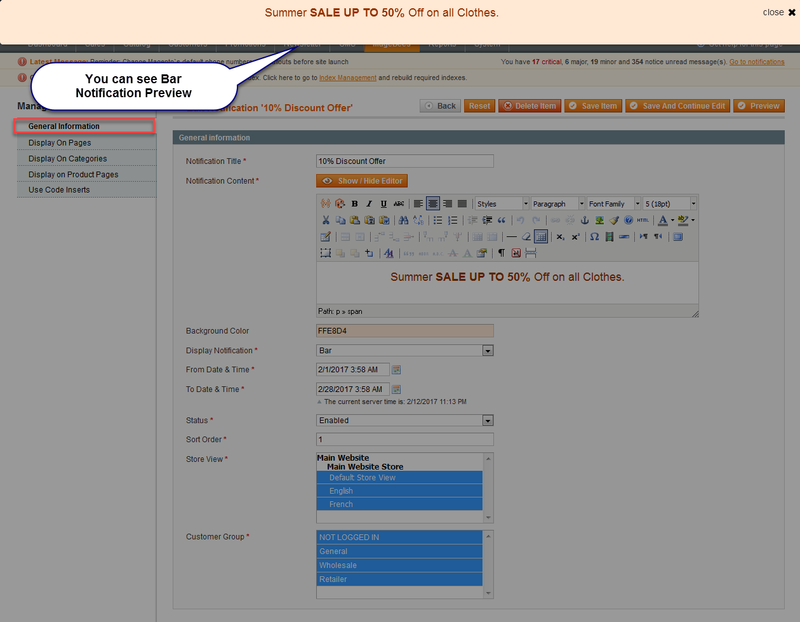 But when I click on MageBees Promotions Notification Pro Configuration page will get a 404. :(. 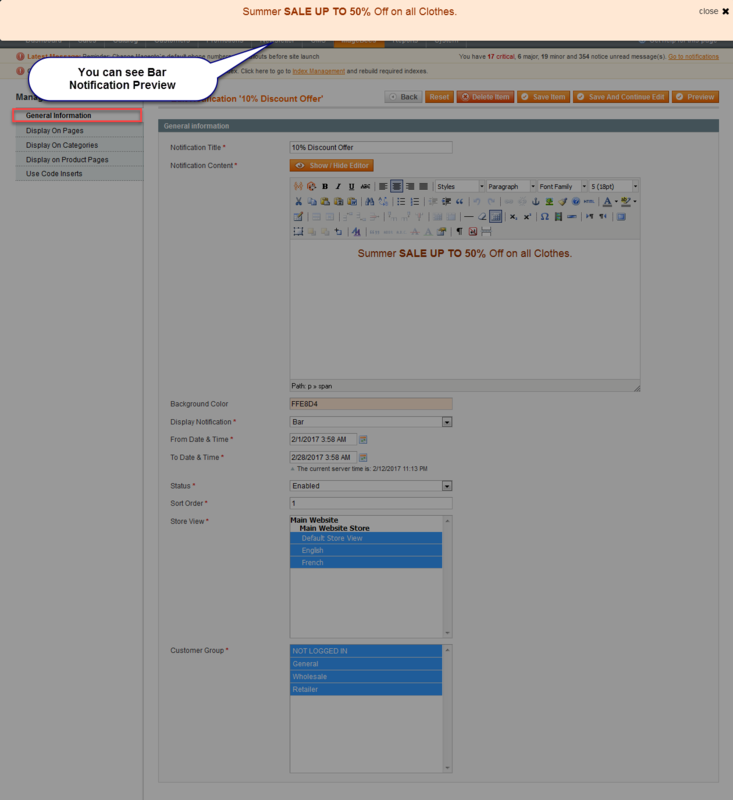 Ans : After installing Extension logout from admin account and Re-login and Refresh Cache. Q-2: Date Range Condition not working ? 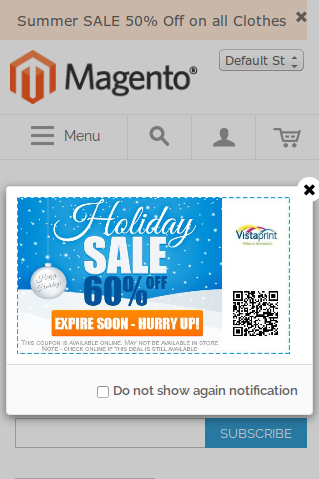 Ans : This is happen due to different time-zone in your magento store. If you want to set same date and time then, please set same time-zone as original website having. Q-3: CONNECT ERROR: Failed to open file Error when install extension using magento connect. Ans :If you face connect error failed to open file when install extension then follow this steps.